Great news for all B.A.P fans (BABYs) in Singapore! 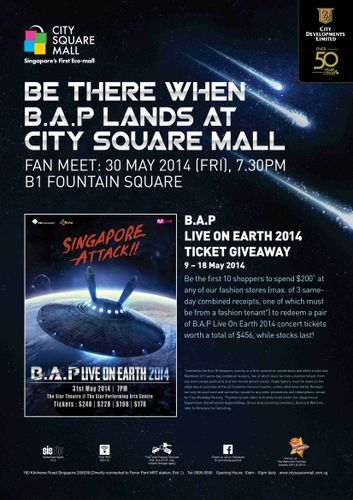 In conjunction with their upcoming concert in Singapore, B.A.P will be holding a fan meet on 30 May 2014 (Friday), 7.30pm at the B1 Fountain Square at City Square Mall. Don't miss out on this great opportunity to see them up close! For those who were unable to get tickets for "B.A.P Live On Earth 2014" in Singapore, City Square Mall is also giving away 10 pairs of tickets to "B.A.P Live on Earth 2014" (each pair is worth SGD$456) to the first 10 shoppers who spend $200 at any of their fashion stores from 9-18 May.